Come and raft the Salt! 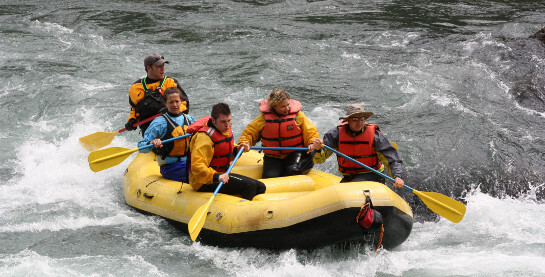 These commerical rafting outfitters provide tons of fun with affordable packages for the entire family and/or group. Enjoy a truly unforgettable experience rafting with the White Mountain Apache Tribe! A Daily Rafting Permit and a signed waiver is required for each person for each day they are rafting or floating (usiing rafts, kayaks or boats) either entering or exiting the Fort Apache Indian Reservation. All rafting trips going beyong the "Hoodoo" camp area are required to purchase a 2-day permit for each individual rafters. Rafters starting their trip from Gleason Flat need to have a Daily Rafting Permit covering the for the entire time (days) they will be on the Fort Apache Indian Reservation. Important reminder, all individuals holding a valid Daily Rafting Permit are allowed one night of camping. The Salt River is open year round to river rafting. Water flows are best during the peak spring runoff period (typically March through May) although optinum rafting conditions will vary from year to year. River rafting is restricted to the Salt River, downstream from the Salt River Canyon Bridge (Hwy 60) ti tge west boundary of the Reservation only. All other Reservation waters are closed to rafting. SALT BANKS. The area between Salt River Draw and one mile downstream of Rock Canyon and between Salt River and north to the rin of the Salt River Canyon is CLOSED to all non-tribal members. Non-members can only use Route G1 as an access road through the area. Each person purchasiing a rafting permit must sign in a wavier (mandatory) prior to putting into the river. NO Exception, everyone holding a 2-day or more River Rafting Permit is required to take tye followihg equipment: fire-pans, trash contaiiners/bags and uman waste disposal containers. All refters must pack out trash, ashers and human waste. It is illegal to burn or bury any trash. Must have a professional whitewater quality boats (no rubber duckies, open canoes, etc). Each rafter must possess a personal flotation device, along with (1) spare paddle and (1) throw rope.